Shahi Imam of Delhi’s Jama Masjid Maulana Ahmed Bukhari on Saturday appealled to Muslims to support Samajwadi Party (SP) in the forthcoming Assembly polls in Uttar Pradesh terming its supremo Mulayam Singh Yadav a true well wisher of the community while criticising the Congress for “betraying” their cause. Addressing a press conference here with Mulayam, Bukhari said that he had been assured by the SP chief that his party would work for the betterment of Muslims. He also accused the Congress of betraying the community during its successive regimes since independence. “The Sachchar Committee had been set up by the Congress not for ascertaining the real condition of the Muslims but to know how much the party has ruined the Muslims during its 60 years of rule,” Bukhari said. At a joint press conference in Lucknow with Mulayam, Bukhari said the SP chief had promised him that his party would work for betterment of Muslims in the event of its returning to power in the state. Therefore, Muslims should ensure victory of Samajwadi Party candidates, he said. Mulayam on his part said, "I will try to prove myself worthy of the expectations of Muslims and Imam Saheb." 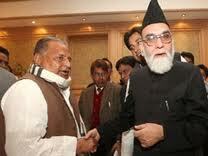 Bukhari alleged that the Congress was mainly responsible for the poor state of Muslims in the country.